SEMA Hall of Fame - Charlie Van Cleve, 2004, Hedman/TD Performance. 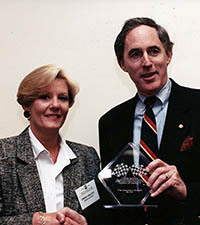 Charlie Van Cleve’s reaction to being inducted into the SEMA Hall of Fame was typical of her humor: “The first thing I was going to do was to call SEMA and say that there’d been some sort of mistake,” she said. “I’m sure I’m not old enough to qualify.” In the case of Van Cleve, her accomplishments would certainly warrant the Hall of Fame committee waving the 40-year minimum age requirement. 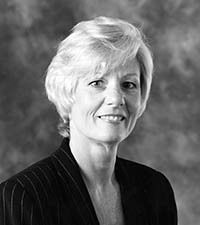 Van Cleve got her start in the automotive aftermarket as an inside sales person at Hedman Hedders. Her ever-growing interest in specialty cars and all things performance related-—along with her affinity for the people in the business— compelled her to become even more involved in the industry. Today, Van Cleve is the Vice President, Sales for Hedman Manufacturing. Her personal rise to prominence during her many years in the industry is matched only by the benefits and successes realized by the industry as a result of her efforts. Van Cleve’s accomplishments are far too numerous to include in the space allotted, so a highlight reel of sorts will have to suffice. 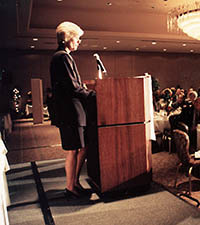 In 1984, Van Cleve was the first woman to receive the Performance Warehouse Association (PWA) Person of The Year award. 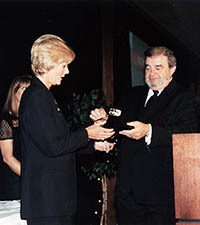 A few years later, in 1989, she received the SEMA Person of the Year award. 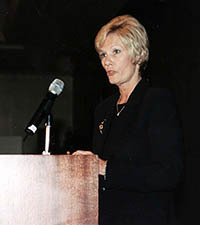 In 1999, Van Cleve was elected Chairman of the Board of Directors for SEMA—the first woman in the history of the organization to lead the association. When pressed beyond the fact that she may not qualify for the Hall of Fame because she doesn’t meet the minimum age requirement, Van Cleve was clearly moved by the honor. “When I found out, I was really speechless,” she said. “I think of people like Isky and Edelbrock Sr. and the products they’ve produced—products that have made this industry possible.” After a long pause she added, “I totally feel not worthy.” Not worthy? Ms. Van Cleve, the industry obviously, and respectfully, disagrees.